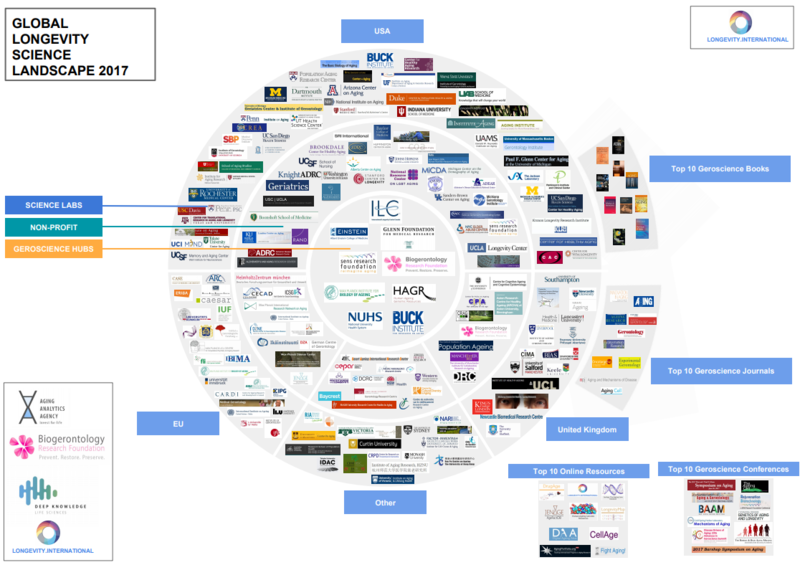 The Biogerontology Research Foundation has embarked on a year-long mission to summarise in a single document the various emerging technologies and industries which can be brought to bear on aging, healthy longevity, and everything in between, as part of a joint project between The Global Longevity Consortium, consisting of the Biogerontology Research Foundation, Deep Knowledge Life Sciences, Aging Analytics Agency and Longevity.International platform. The first of these landmark reports, entitled ‘The Science of Longevity‘, standing at almost 800 pages in length, seeks to rectify this. 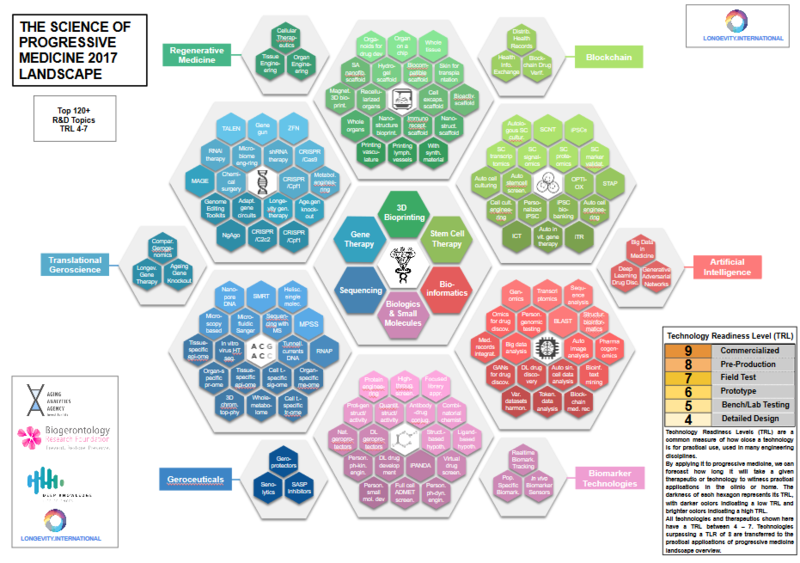 In this report great care was taken to visualize the complex and interconnected landscape of this field via state of the art infographics so as to distill the many players, scientific subsectors and technologies within the field of geroscience into common understanding. Their hope was to create a comprehensive yet readily-understandable view of the entire field and its many players, to serve a similar function that Mendeleev’s periodic table did for the field of chemistry. While these are static infographics in the reports, their creators plan to create complimentary online versions that are interactive and filterable, and to convene a series of experts to analyze these infographics and continually update them as the geroscience landscapes shifts. Similar strategies are employed in Volume II to illustrate the many companies and investors within the longevity industry. Since these reports are being spearheaded by the UK’s oldest biomedical charity focused on healthspan extension, the Biogerontology Research Foundation is publishing them online, freely available to the public. 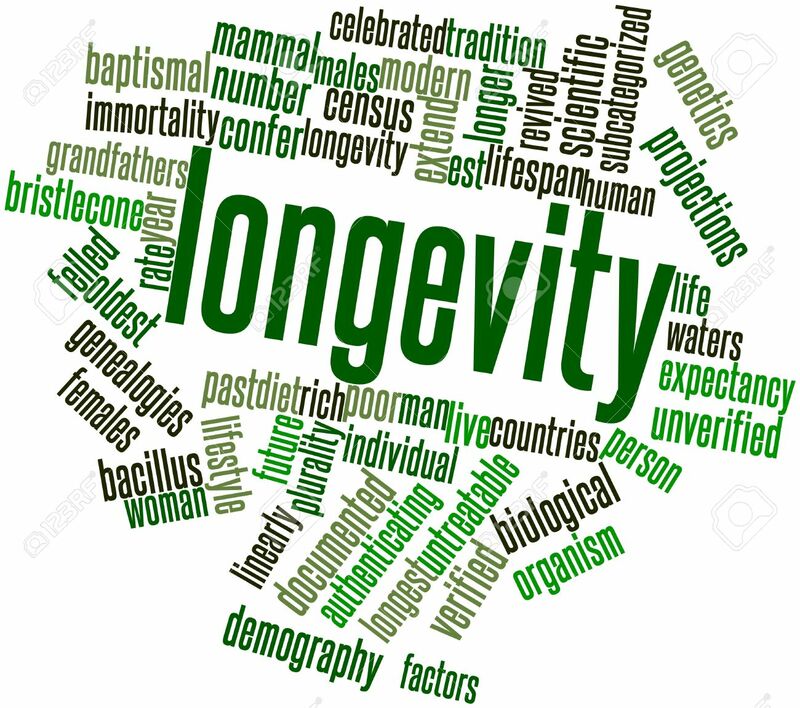 While the main focus of this series of reports is an analytical report on the emerging longevity industry, the reports still delve deeply into the science of longevity, and Volume I is dedicated exclusively to an overview of the history, present and future state of ageing research from a scientific perspective. These reports will be followed up throughout the coming year with Volume 3 (“Special Case Studies”), featuring 10 special case studies on specific longevity industry sectors, such as cell therapies, gene therapies, AI for biomarkers of aging, and more, Volume 4 (“Novel Longevity Financial System”), profiling how various corporations, pension funds, investment funds and governments will cooperate within the next decade to avoid the crisis of demographic aging, and Volume 5 (“Region Case Studies”), profiling the longevity industry in specific geographic regions.